Usually, I get booked to cover the bride's side. However, this time I was happy to shoot the preparation time at the groom's home. 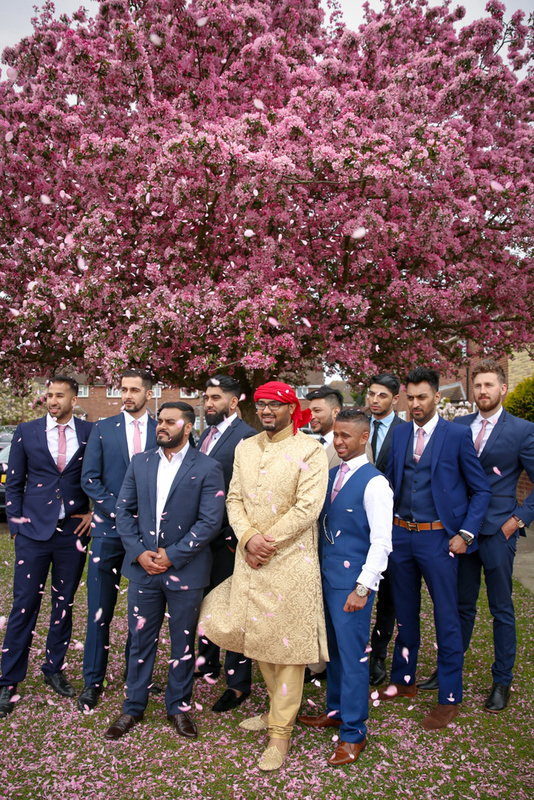 After a few groom's prep shots and his friends getting ready photographs, we headed outside where I spotted a blossoming tree. This immediately became out central group shot point. Afterwards we headed to Ariana Gardens, a picturesque location and a light venue which offers spectacular and well looked after gardens for couples photoshoot. The bride's side stopped the baraat at the entrance and would not let them in unless paid. After some serious negotiation the groom made his way to the hall. The Nikah ceremony took place the same day. Once the papers have been signed, the bride came to the hall. This was an emotional moment for her to walk down the isle, as can be seen at the photos. After the cake cutting the couple headed to the garden where they had their couple shoot done.